Steve Harvey is a well known stand up comedian, who also has a hand in writing, producing, and film acting. His roles are diverse, reflecting his many interests and life experiences. He did not set out initially to become a stand up comedian, but once he discovered the art of comedy he never looked back. As of 2019, Steve Harvey’s net worth is roughly $160 million. Steve Harvey was born on January 17, 1957 in Welch, West Virginia. He was the youngest of five children, whose father was a coal miner. His family later moved to Cleveland, Ohio, where he graduated from high school. Following graduation, he moved back to West Virginia to attend university. After university he found himself working a string of jobs, including selling insurance, delivering mail, and even boxing. Harvey never found his niche, until he started performing stand up comedy in 1985. After four years of performing stand up comedy on small stages he found success after reaching the finals for the Second Annual Johnnie Walker National Comedy Search in 1989. In 1993 He took over as host Showtime at the Apollo, which lasted until 2000. From 1996 until 2002 Steve Harvey had his own sitcom on the WB Network, the Steve Harvey Show. This show forged the friendship between him and Cedric the Entertainer, who became his partner on the Kings of Comedy Tour, which also included Bernie Mac and D.L. Hughley. The tour became the highest grossing comedy tour to date in the United States. Other endeavours of Harvey’s include his daily talk radio show, the Steve Harvey Morning Show, roles in movies such as You Got Served, and relationship advice books. Most recently he became the host of Family Feud. Harvey has become one of the richest comedians in the world, alongside the likes of Kevin Hart, Jerry Seinfeld, Larry David, and Matt Groening. View our larger collection of the best Steve Harvey quotes! Steve Harvey became a household name and role model for many African American in the 90’s. His TV sitcom revitalized the WB and millions tuned into his weekly show. Harvey didn’t slow down, and took on multiple roles at once, reflecting his drive and determination. 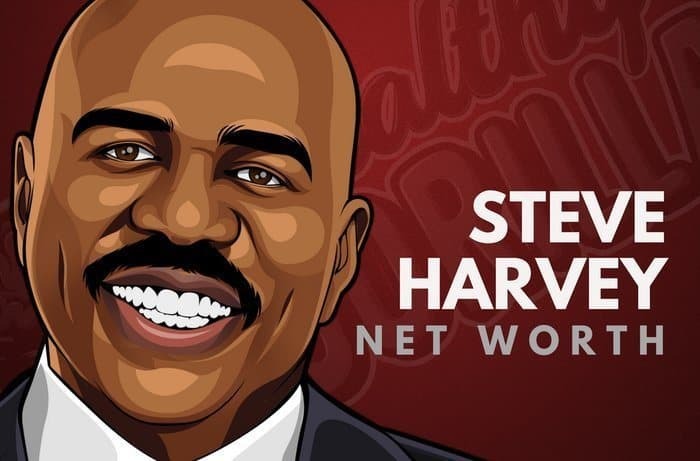 Steve Harvey’s net worth continues to grow, as does his portfolio. What do you think about Steve Harvey’s net worth? Leave a comment below. I think Steve Harvey has the best “TalkShow” on television!! He’s compassionate and gives and helps many people in need. He loves his family and that’s quite evident! I’m impressed by the way he helps young men who are being reared by single mothers, he’s got a giving heart!! I’m 85 years old and I sure would love to meet him! Praying for him!